Ok, booklovers. Step away from your computers. Walk - do not run - to your nearest bookstore. Purchase The Thirteenth Tale. Read immediately. No, really. If you haven't read this, you're missing out. If you haven't heard of it, you are missing out and you really don't even know what you're missing. 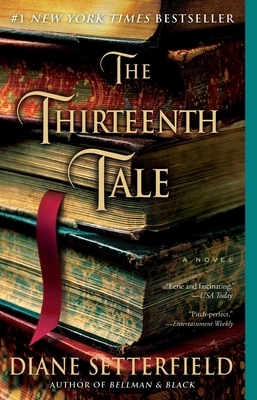 The Thirteenth Tale, by Diane Setterfield, is one of those books that has lingered on the edge of my reading mind for what feels like forever; when a good friend (and brilliant music reviewer) sent me a copy for Christmas, I moved it to the top of my reading pile. My gripe is not with lovers of the truth but with truth herself. What succor, what consolation is there in truth, compared to a story? What good is truth, at midnight, in the dark, when the wind is roaring like a bear in the chimney? What you need are the plump comforts of a story. The soothing, rocking safety of a lie. "'Beginnings, middles and endings, all in the correct order. No cheating. No looking ahead. No questions.'" Setterfield's - or Winter's, or perhaps Lea's - story is fascinating, amounting to a series of mysteries and confusions that read like a detective novel, in which reader must parse together one clue after the next to determine the truth of events. And, also like a masterful detective novel, the final revelation of facts left me desperately wanting to start over and re-read the entire 400+ page novel under the new light cast upon events. Bottom line: The Thirteenth Tale is a novel like that. It is a novel that at once follows all of its own rules - a novel of stories; a novel with beginnings, middles and endings; a novel that keeps its subjects alive by the miracle of ink on paper - while simultaneously exalting its own presence on your shelves. I repeat: if you haven't already read this one, make it a point to do so. Soon. I predict that you will appreciate the sticky bits of well-written web that linger in the corner of your mind as you approach the next title on your list. If you can't make it to a bookstore soon, I'll make a deal with you: I wound up with two copies of the book, so I'll be giving one away. I'm keeping the inscribed copy, so the hardcover from the bargain bin is up for grabs. Simply leave a comment to enter. +1 for followers (RSS, Google Friend Connect, Facebook or Twitter). Contest closes next Wednesday, Jan 19th. Open to US and Canada only (sorry to all the international readers out there, but this bookworm's broke). Note: All page references above refer to the paperback edition. Yes! This book had me at the cover - and oh what a joy it was to read. I'm so glad you loved it too. I love the quote from pg 289 . . . so true. This book is why I never mind judging a book by its cover. I bought it on impulse because of the books on the cover...but it is one of my favorite books of all time. I've read and re-read it multiple times. Glad you enjoyed it! I felt exactly the same way you did. So much so I gave my copy to my sister, who read it and raved and gave it to my mom, who read it and raved and gave it to my other sister...I did go out and get another copy for myself, and I've sold it a few times here at the store. It's a great booklover book! This is the third time I've seen this title produce such fervor in the last week. I am not convinced that I must get it. I have been longing for a thrilling story that really engages me and refuses to let me put it down. This review is perfect! I'm really glad I found your blog--the setup alone is so pleasant. Thanks! I am** ! oh. me. I've been eyeing this one for awhile but your review makes me want it even more. Thanks for the giveaway. I'm a twitter follower @readingangel002. I have been meaning to read this for what feels like forever, and for some reason never have. I'd love to win a copy, but now I think I'm going to have to go out and finally buy it if I don't. I'm a GFC follower of your blog (Jessica M.) and on Twitter too (@crazylilcuban). Thanks for the giveaway. I've heard of this one before and have went back and forth between wanting to read it and thinking I should pass. Then I heard it compared to The Shadow of the Wind. Have you read that? If so do you agree with the comparison? Your review puts it on my "must read soon!" list. Would love to be in the running for the extra copy. I read this book for a book club and loved it, but I want to read it again because I think I would love it even more after a second read. Trish - Glad you enjoyed it, too. Isn't that quote great? Brent - I'm so happy to hear it stands up to the test of re-reads. I'm already itching to re-read this now that I know all the facts. Or think I do, anyway. Steph - Thanks! It IS the kind of book you want to force into the hands of other readers, no? Reading Angel & Jessica - Thanks for entering. Brenna - I wouldn't compare them directly, as they are very different stories, but The Thirteenth Tale did set my mind to wandering back to Shadow of the Wind. They are both odes to books and the power they hold over us, and both combine the perfect amount of fast-paced mystery with beautiful insight into the world around us and the mind of the reader. Ok, now I'm just gushing again. Denise - Definitely a must read soon! Anna - See my comment above to Brenna. It's not the same, but the two seem to go together in my mind. This is my obligatory comment to win the book. It will be added to the large pile of books I need to read that has been growing taller by the year. I'm not commenting to win since I just bought a copy of this today. However, I did want to let you know that I gave you an award over at my blog. Jurg - Thanks for the obligatory comment. Laura - Thanks for the award!! Hope you enjoy The Thirteenth Tale, too. I would love to win the free copy, Thanks! I am glad I stumbled across your blog. I just lvoe reading and this looks like a great read. I would love to win a copy. Tribute Books Mama & Melanie - Consider yourselves entered! Wow, what a review! You totally sold me on this book.